Asanuma Shashinki-ten (浅沼写真機店) was a Japanese distributor in the late 1920s and 1930s, based in the Marunouchi Building in Tokyo. In the mid-1930s, the company advertised Leica cameras. In the second half of the 1930s, it was distributing photographic products under the Leiket brand, sometimes displaying KAPPA markings. It seems that this company was not related to Asanuma Shōkai, but this is not known for sure. ↑ Advertisements in Asahi Camera September 1929 (p.A15) and February 1930 (p.A15); advertisement in Shashin Salon January 1934; advertisement in Asahi Camera July 1936, p.A31; advertisement on p.8 of Nihon Shashin Kōgyō Tsūshin, December 15, 1939, reproduced on p.42 of Hyaku-gō goto jūkai no kiroku. ↑ Advertisement in Shashin Salon January 1934. ↑ 3.00 3.01 3.02 3.03 3.04 3.05 3.06 3.07 3.08 3.09 3.10 3.11 3.12 3.13 Advertisement in Asahi Camera July 1936, p.A31. ↑ 4.0 4.1 4.2 4.3 4.4 Advertisement on p.8 of Nihon Shashin Kōgyō Tsūshin, December 15, 1939, reproduced on p.42 of Hyaku-gō goto jūkai no kiroku. ↑ The February 1930 issue of Asahi Camera contains both an advertisement by Asanuma Shōkai on p.A3 and an advertisement by Asanuma Shashinki-ten on p.A15. Asanuma is a Japanese family name, and the existence of two different Asanuma companies is not implausible. 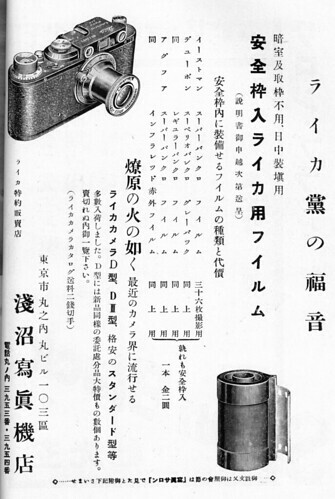 ↑ The new products column of Asahi Camera February 1936, p.330, features a Japanese copy of the Zeiss 436/5 prism finder, sold at ¥18. The document does not mention a company name, but this was perhaps another product by Asanuma Shashinki-ten. Asahi Camera February 1936. "Atarashii kikai to zairyō" (新しい機械と材料, New equipment and machinery). P.330. Nihon Shashin Kōgyō Tsūshin (日本写真興業通信). Hyaku-gō goto jūkai no kiroku (百号ごと十回の記録, Ten records, every hundred issues). Tokyo: Nihon Shashin Kōgyō Tsūshin Sha (日本写真興業通信社), 1967. No ISBN number. 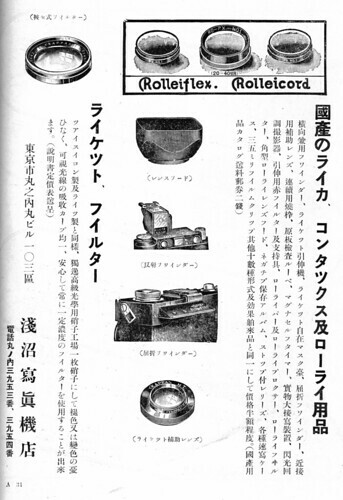 Advertisement by Asanuma Shashinki-ten on p.42, corresponding to p.8 of the December 15, 1939 issue. This page was last edited on 1 January 2019, at 19:26.